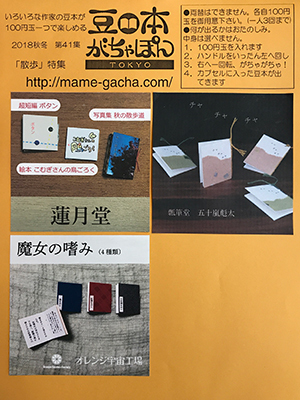 Miniature books are handmade by the artists. They are the limited editions. We usually update current information here, but sometimes it may be sold out even if there is no notice. When it is sold out, please wait one week to six months to be created new ones. 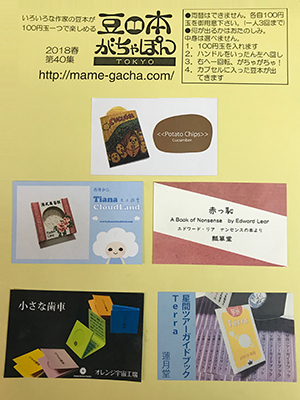 We want many customers enjoy the Mamehon-Gachapon, so that sometimes the stores set the limit depending on the situations. For example, you can buy until 3 capsules at one time. The capsules come out randomly by the machine. It means that you can’t choose the books by yourselves. The machines accept only 100 yen coins. Please prepare the coins by yourselves. 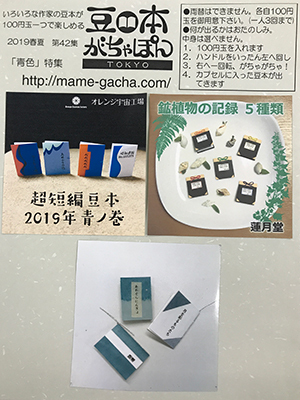 We hope you enjoy our Mamehon-Gachapon very much.